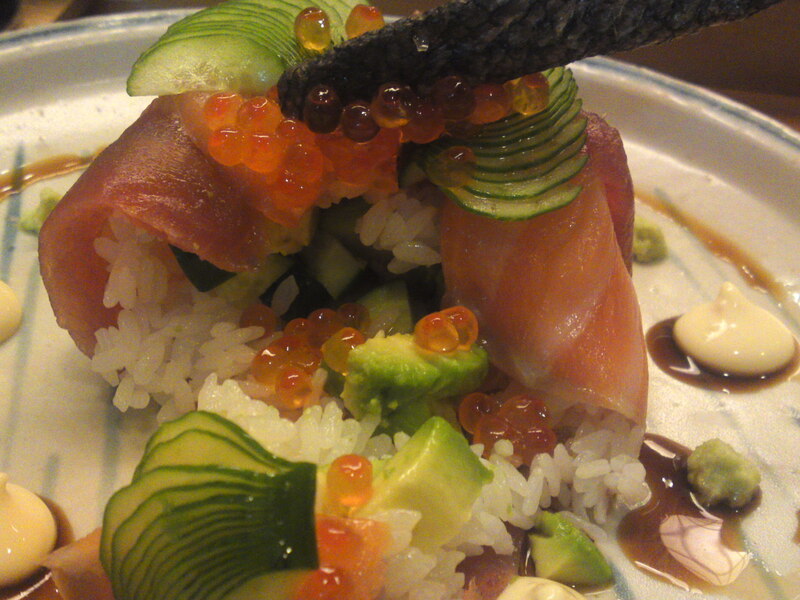 Sushi Design by Chef Kenta Birukawa at Sushi Ko in Shizuoka City: Sushi Charlotte! As promised in the report on the gunkan feast here is another example of Chef Kenta Birukawa/尾留川健太さん’s ingenuity which demonstrates why he received an award as best sushi designs from his peers this year! Actually I had asked him to come up with a new version of his acclaimed sushi Millefeuille and instead created a Charlotte-like sushi cake! 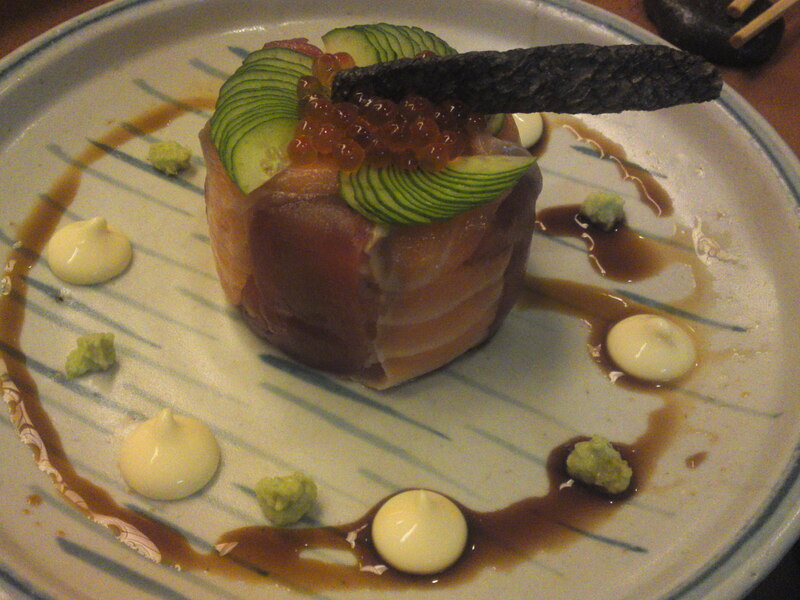 The whole was conceived inside a metal ccircle by lining the inside first with raw salmon and tuna and then filled progressively with sushi rice and other ingredients! 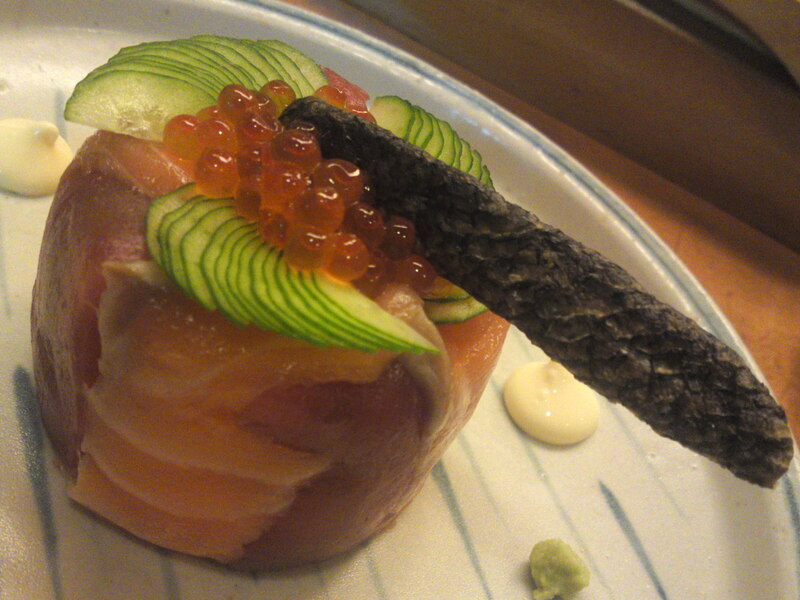 The tail is grilled salmon skin! A crunchy and tasty tidbit of its own! 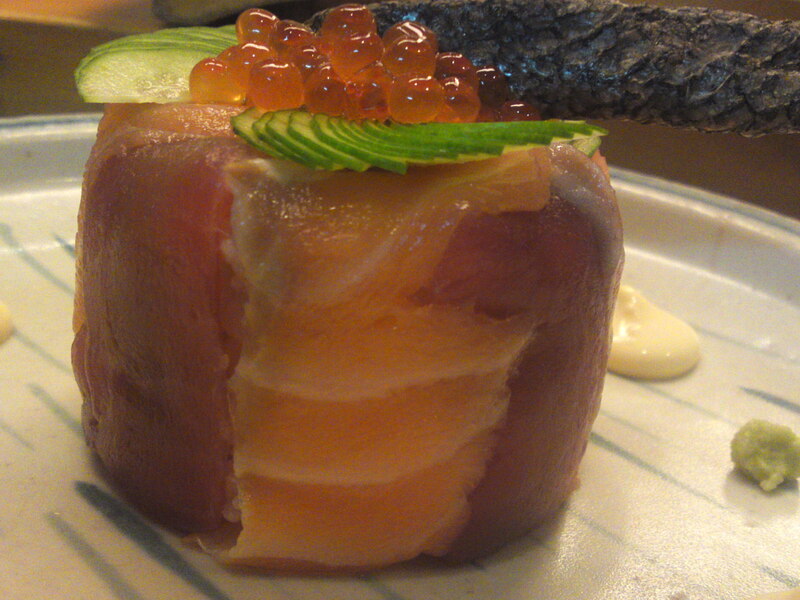 Once filled Chef Birukawa partly closed the top by fording the fish inside before topping it with other ingredients! 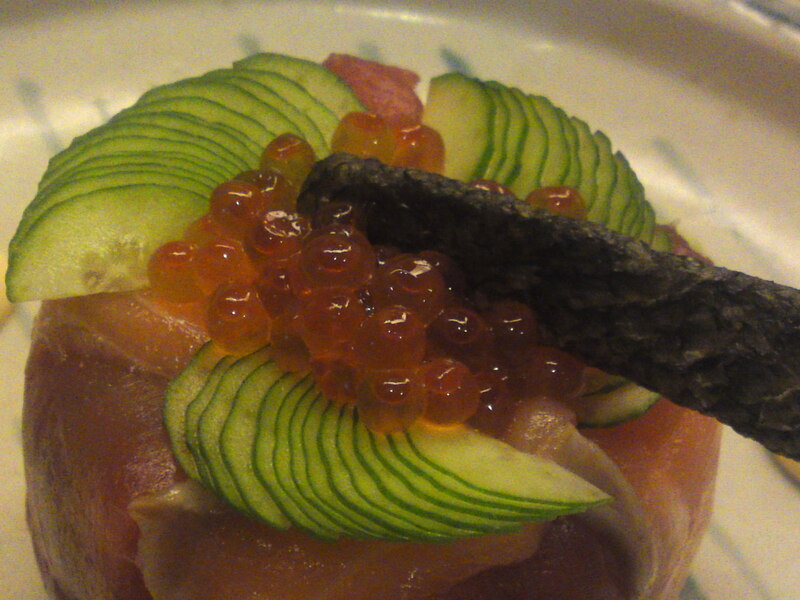 The topping consisted of ikura/salmon roe, thinly sliced cucumber and grilled salmon skin! It was such a sinful pleasure to open it and find out what was hidden inside! Perfect balance in taste with avocado and cucumber pieces inside and so healthy! A cake for the health conscious gastronomes! 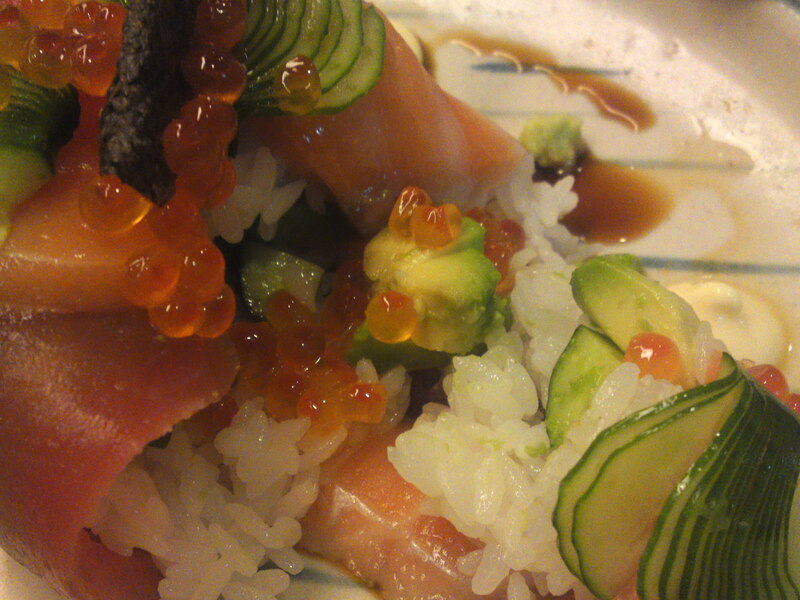 Previous PostSushi Design by Chef Kenta Birukawa at Sushi Ko in Shizuoka City: Gunkan Feast!Next PostSushi Design by Chef Kenta Birukawa at Sushi Ko in Shizuoka City: The Other Tidbits!